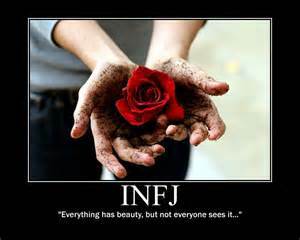 INFJs: What are your hobbies? 2. Sketching. Not that I’m any good at it, but I enjoy it nonetheless. 3. Gardening. Veggies and flowers. I love cooking with food I just picked from my own garden! I like canning my veggies, as well. 4. Archery. I am actually not bad! 5. Music. I love listening to music..allll the time. I can’t do chores without it. 6. Walking/running outdoors. I like to be outside and smell the flowers and soak up the sun. And getting out to walk or run daily keeps me healthy. 7. Photography/scrap booking. Not professional, just with my phone. If I see something pretty, I have to take a picture. If my son does something adorable, I have to take a million more. I like having the memories captured in a photo to look at later. I make scrap books out of all of them, and they come out pretty darn good! Everything is beautiful, but not everyone sees it.